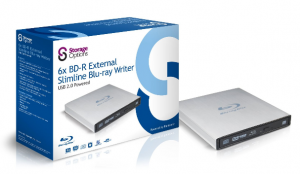 If you are looking for added storage on your computer system, you may want to shop around for a blu-ray recorder, such as the Storage Options SOX6XBD-SLV Options 6X external slim blu-ray writer. Blu-ray discs are capable of saving over five times the amount of a standard DVD, giving you not only exceptional storage capacity, but the ability to create your own high-definition videos. However, before purchasing the Storage Options device, there are a few specifications and bits of information you need to take into consideration, just to make sure it is exactly what you are looking for. The Storage Options blu-ray recorder is a portable device. This allows you to connect it to any computer system, such as a desktop or laptop. It is perfect if you are on the go and always need a portable unit capable of backing up important data files. It also connects directly to a computer via USB data cable. All modern computers have a USB connection port, so using adapters and other cables is not necessary. Of course, you don’t always need a blu-ray burner to back up data. On occasion you may want to create a music CD, or rip a video file to a standard-definition DVD. The Storage Options blu-ray recorder is able to write data to all major formats of disc, including CD, DVD and data DVD-RAM discs. The hardware also comes with a provided burning program title, to ensure you always have an easy way to back up information.